Chronic obstructive pulmonary disease (COPD) is a disease due to chronic inflammation of the airways. This disease is accompanied by the presence of chronic obstruction. Multiple lines of evidence have indicated that a wide range of factors (i.e., genetical and environmental) are involved in the initiation and progression of COPD. Smoking is known as one of the main factors which could be associated with chronic inflammation of the airways. Inflammation is an important factor which has critical role in the initiation and progression of COPD. It has been shown that various immune cells and a variety of cellular and molecular pathways are involved in inflammation and play critical roles in COPD pathogenesis., Among many cellular and molecular targets, microRNAs (miRNAs) have emerged to be involved in COPD pathogenesis., Deregulation of miRNAs is associated with the initiation and progression of several diseases such as stroke, cardiovascular diseases, diabetes, cancer, and inflammatory diseases.,,,,,,, Many miRNAs including miR-223, miR-1274a, miR-101, and miR-144 exert their effects via inhibition/activation of a sequence of cellular and molecular pathways (i.e., Smad, transforming growth factor β [TGF-β], Kras, Notch, and Wnt) involved in COPD., Hence, it seems that these molecules could be used as new diagnostic and therapeutic biomarkers for patients with COPD. Alterations of miRNA expression could occur due to various events such as mutations and inhibition/activation of various targets.,, Exosomes are extracellular vesicles which could change the expression of miRNAs in recipient cells. These nanocarriers could transfer various signals via cargos such as messenger RNAs (mRNAs), miRNAs, and proteins to recipient cells., It has been shown that several exosomal miRNAs such as miR-100, miR-21, and miR-181a could be used as diagnostic and prognostic biomarkers in COPD.,, In the current review, we focus on various miRNAs that could be utilized as diagnostic and prognostic biomarkers for COPD patients. Moreover, we highlighted the role of exosomes containing various cargos, especially miRNAs as diagnostic and therapeutic biomarkers for patients with COPD. COPD is a chronic heterogeneous disease of the lungs which could be characterized by persistent and excessive inflammation, alveolar lesions, accelerated decrease in lung function, and airflow limitation. Many factors such as inflammation and cell structure changes could be involved in the initiation and progression of COPD. miRNAs have also been suggested to be involved in the COPD pathogenesis [Figure 1]. These molecules are known as epigenetic regulators which exert their effects via targeting a variety of cellular and molecular pathways.,,,,,,, It has been shown that deregulation of miRNAs could be associated with the initiation and progression of several diseases such as cardiovascular diseases, stroke, diabetes, cancer, and COPD.,,,,,, Multiple lines of evidence have revealed that up/down-regulation of various miRNAs (i.e., miR-21, miR-145, miR-181, miR-1, miR-144, and miR-101) could be related to COPD pathogenesis., It has been showed that a variety of external factors (i.e., smoking and oxidative stress) and internal factors (i.e., deregulation of various growth factor ligands, interleukins [ILs], and receptor tyrosine kinase) could lead to deregulation of many cellular and molecular pathways and miRNA expression.,, These events are associated with small and large alterations in molecular and cellular levels and could contribute to the progression of COPD. MiRNAs are involved in various signaling pathways such as TGF-β signaling pathway. Several studies have confirmed that TGF-β pathways play critical roles in COPD pathogenesis., Baraldo et al. confirmed that downregulation of TGF-β type II receptor (TGF-βR2) is associated with the progression of COPD. Their results indicated that the expression profile of TGF-β1 in bronchial glands was similar in the two groups of cases while there was a decreased in expression of TGF-βR2 in smokers with COPD than in smokers with normal lung function. Expression of TGF-βR2 was associated with the values of Reid's index which is known as a measure of gland size. These findings suggested that TGF-β signaling pathway has key roles in COPD pathogenesis. Ezzie et al. assessed gene expression profiles of many miRNAs and mRNAs in 26 patients with COPD. They showed that miR-146a, miR-15b, miR-223, and miR-1274a were upregulated in COPD samples. Moreover, they showed that a variety of genes (e.g. BMP5 and BMP6, TGF-βR1 and TGF-βR2, and SMAD7) involved in TGF-β signaling pathway were downregulated in patients with COPD. Bioinformatics analysis indicated that various miRNAs could target these genes in COPD patients. For example, upregulation of miR-15b in a bronchial epithelial cell line could be associated with downregulation of SMAD7, SMURF2, and downstream decorin protein. These results proposed that many miRNAs are involved in TGF-β signaling pathway via targeting various genes and thus could contribute to the initiation and progression of COPD. O'Leary et al. indicated that miR-145 targets SMAD3 which is known as one of the important downstream signaling molecules in the TGF-β pathway and plays critical roles in the initiation and progression of COPD. They showed that TGF-β could induce the expression of SMAD3 via increasing miR-145 in COPD patients. It has been shown that of miR-145 could be regulated by the MAP kinases, MEK-1/2, and p38 MAPK pathways. Upregulation of miR-145 in patients with COPD could inhibit the release of IL-6 and CXCL8. These findings suggest that miR-145 could regulate pro-inflammatory cytokine release from airway smooth muscle cells in COPD via targeting SMAD3. Kusko et al. assessed several genes and pathways involved in idiopathic pulmonary fibrosis (IPF) and COPD. They showed that various members of the signaling pathways including hypoxia-inducible factor-1α, MDM2, and NFKBIB are involved in COPD and IPF pathogenesis. Moreover, they revealed that alternative splicing of p53/hypoxia pathway-related molecules NUMB and PDGFA occurred more frequently in IPF or COPD compared with the control group. RNA-seq analysis indicated that among many miRNAs, miR-96 acts as a major regulatory hub in the p53/hypoxia gene-expression network. The regulation of miR-96in vitro recapitulates disease-related gene-expression network. These findings suggest that a variety of signaling pathways that regulate miRNAs network are involved in COPD pathogenesis and miRNAs could be utilized as potential candidates for the diagnosis and prognosis of COPD. Accumulating evidence indicates that smoking is one of the major risk factors for COPD which could be associated with the progression of COPD in various stages. Numerous studies have confirmed that smoking can down/up-regulate many miRNAs and could thus affect COPD progression. Du et al. assessed the expression levels of miR-181c in 34 patients with COPD (smoking cases) compared with healthy controls. Their results indicated that miR-181c could be significantly downregulated in patients with COPD versus healthy controls who had never smoked. They also showed that upregulation of miR-181c could be associated with several effects such as reduction of the inflammatory response, neutrophil infiltration, reactive oxygen species generation, and inflammatory cytokines production. Downregulation of miR-181c could be associated with opposite effects. Moreover, they revealed that miR-181c exerts its effects via targeting CCN1. Downregulation of miR-181c could lead to an increase in CCN1 expression in the lung tissues of COPD patients compared with healthy controls. These findings suggested that miR-181c could be used as a therapeutic target for the treatment of patients with COPD. Paschalaki et al. indicated that deregulation of miR-126 is associated with activation of ATM kinase. They showed that the levels of miR-126 were downregulated in blood outgrowth endothelial cells from smokers and COPD patients compared with nonsmoker subjects. These results suggested that downregulation of miR-126 via targeting ATM could promote tissue aging and dysfunction in smoker and COPD subjects. Hence, this miRNA could be utilized as a novel therapeutic target in patients with COPD. Besides the role as therapeutic targets, miRNAs could be employed as prognostic and diagnostic biomarkers in various diseases such as COPD. COPD is a multifactorial disease, and various efforts to find effective diagnostic and therapeutic platforms for treatment of patients with COPD have been made. It has been shown that the levels of various cytokines (i.e., IL-6, IL-8, IL-10, IL-17, IL-12p70, and IL-1β), cysteinyl-leukotrienes (LTs), LTB4, prostaglandin E(4), hydrogen peroxide (H(2)O(2)), and 8-isoprostane could be associated with COPD pathogenesis. Despite many efforts, effective diagnostic biomarkers are still rare. Previous studies confirmed that miRNAs play critical roles in COPD pathogenesis. Hence, it seems that these molecules may be utilized as new prognostic and diagnostic biomarkers for monitoring patients with COPD. Soeda et al. investigated the expression levels of various circulating miRNAs in the plasma of 40 COPD patients. They indicated that deregulation of many miRNAs could be associated with progression of COPD. Their results revealed that a variety of miRNAs including miR-29b, miR-483-5p, miR-152, miR-629, miR-26b, miR-101, miR-106b, miR-532-5p, and miR-133b were significantly downregulated in the plasma from COPD patients compared with control group. Moreover, they showed that there was negative association between the levels of miR-106b and duration of disease since the diagnosis in COPD ex-smokers and duration of smoking in COPD current smokers. These findings suggested that downregulation of miR-106b could reflect persistent and systemic alteration even after the discontinuation of smoking in patients with COPD. Hence, miRNAs may be utilized as diagnostic biomarkers for COPD patients. Kara et al. assessed the expression levels of several miRNAs including miR-16, miR-17, miR-29c, miR-92, miR-125, miR-126, miR-146, miR-155, miR-181, and miR-122 using real-time polymerase chain reaction in 60 patients with COPD. Their results indicated that miR-29c and miR-126 were upregulated in COPD patients Stage III compared with healthy controls. These findings propose that these miRNAs may be utilized as diagnostic biomarkers for patients with COPD. [Table 1] lists various miRNAs involved in COPD pathogenesis which could be used as diagnostic and therapeutic biomarkers for the treatment of patients with COPD. MiR-218-5p is another important miRNA which has a main role in COPD pathogenesis and it seems that it could be used as an effective candidate for the diagnosis and monitoring of patients with COPD. Conickx et al. indicated that various miRNAs such as miR-218-5p were deregulated in COPD patients. They showed that the expression of miR-218-5p could be decreased in smokers without airflow limitation and in COPD patients compared with never-smokers. These results suggest that miR-218-5p has a protective role in cigarette smoke (CS)-induced inflammation and COPD patients and could be used as diagnostic and therapeutic biomarker for the detection and monitoring of patients with COPD. Several studies have indicated that extracellular vesicles such as exosomes are able to carry various cargos. Among several cargos, miRNAs are important and can transfer various cellular and molecular signals to recipient cells. Hence, exosomal miRNAs could be used as new tools for diagnosis and treatment of various diseases such as COPD. Fujita et al. investigated the effect of exosomal miRNAs in the suppression of autophagy in COPD patients. It has been shown that CS exposure could lead to emphysema, increasing of myofibroblast, and airway remodeling, which all contribute to COPD progression. They showed that CS could induce upregulation of exosomal miR-210 in bronchial epithelial cells. Exosomal miR-210 could induce myofibroblast differentiation in lung fibroblasts (LFs). Exosomal miR-210 could directly control autophagy processes via affecting ATG7. The exosomal miR-210 expression is associated with downregulation of ATG7 in LFs. They reported decreased autophagy in LFs from COPD patients, and also, the silencing of ATG7 in LFs could lead to myofibroblast differentiation. These results indicated that CS exposure induces the modification of exosome components and exosomal miR-210 acts as a paracrine autophagy regulator of myofibroblast differentiation. This molecule could be employed as a therapeutic biomarker for patients with COPD. Skeletal muscle weakness is an important systemic complication of COPD which could affect exercise capacity and mortality. Burke et al. assessed the role of exosomal miRNAs in COPD patients who had skeletal muscle weakness. They isolated exosomal miRNAs from serum and bronchoalveolar lavage fluid (BALF) of four patients with COPD. Their results indicated that one exosomal miRNA was upregulated in serum of COPD patients and four exosomal miRNAs were downregulated in BALF of patients with COPD. In silico analysis indicated that these miRNAs could exert their effects via targeting many genes including S6K involved in the mTORC1 signaling pathway which serves as a key regulator of skeletal muscle wasting. These results indicated that exosomal miRNAs play critical roles in skeletal muscle wasting in patients with COPD and could be utilized as diagnostic and prognostic biomarkers for the detection, treatment, and monitoring of patients with this disease. Exosomal proteins (i.e., CD31, C-reactive protein [CRP], soluble tumor necrosis factor receptor 1 [sTNFR1], CD114, and CD66) are other types of biomarkers which could be employed for diagnosis and monitoring of COPD patients [Table 2]. Recently, Tan et al. assessed the expression levels of exosomes in plasma of patients with acute exacerbations of COPD (AECOPD) (n = 20), stable COPD (sCOPD; n = 20), and nonsmoking healthy group (n = 20). Their results revealed that plasma levels of exosomes in AECOPD and sCOPD were significantly increased compared with healthy controls. Moreover, they showed that expression levels of exosomes were associated with plasma levels of CRP, sTNFR1, and IL-6. These findings suggested that exosomes could be anticipated in various pathogenic events involved in AECOPD and sCOPD. Hence, it seems that exosomes and their cargo could be utilized as diagnostic and prognostic biomarkers for the treatment of patients with COPD. It has been shown that persistence of inflammation is one of the important characteristics of COPD. Exosomes could be involved in these events via targeting various cellular and molecular pathways involved in inflammation. Multiple lines of evidence have revealed that several factors such as smoking, acceleration of epithelial cell senescence, airway epithelial cell injury, destruction of pulmonary capillary vasculature, and airway remodeling are associated with COPD pathogenesis. Among various factors, airway epithelial cell injury is known as an important player in COPD pathogenesis. Several studies have indicated that injured lung epithelial cells could be an important source for inflammatory mediators such as granulocyte-macrophage-colony-stimulating factor, IL-1β, tumor necrosis factor-α, TGF-β and CXCL-8. These mediators could exert their autocrine and paracrine effects on several cells. For example, TGF-β could stimulate remodeling of airway cells via modulation and induction of myofibroblast differentiation which is known as one of the main causes of fibrosis development during airway remodeling. It has been revealed that the expression levels of TGF-β in the small airway epithelium of patients with COPD could be associated with the severity of airway obstruction. Li et al. indicated that paracrine activity of various mediators is mediated by various exosomes released from human macrophages. Hence, it seems that chronic exposure to CS could lead to epithelial cell death and lung tissue loss via targeting various exosomes containing mediators. COPD is known as a multifactorial disease, in which many factors such as smoking play critical roles. These factors could exert their effect via targeting vital pathways involved in inflammation. Among many molecules and pathways involved in COPD pathogenesis, miRNAs and exosomes have emerged as important players. It has been indicated that modulation of miRNAs via targeting various cellular and molecular pathways involved in COPD could contribute to the initiation and progression of COPD. The recognition of new markers that related with prognosis, diagnosis, therapy, and response to therapy may help improve and monitor of disease progression in COPD-afflicted patients. Among of various markers, miRNAs and exosomes have been emerged as new tools for using as diagnostic and therapeutic biomarkers in the treatment of COPD. Szymczak I, Wieczfinska J, Pawliczak R. Molecular background of miRNA role in asthma and COPD: An updated insight. Biomed Res Int 2016;2016:7802521. Lee SW, Lien HC, Chang CS, Yeh HZ, Lee TY, Tung CF, et al. The impact of acid-suppressing drugs to the patients with chronic obstructive pulmonary disease: A nationwide, population-based, cohort study. J Res Med Sci 2015;20:263-7. Li Y, Lu Y, Zhao Z, Wang J, Li J, Wang W, et al. Relationships of MMP-9 and TIMP-1 proteins with chronic obstructive pulmonary disease risk: A systematic review and meta-analysis. J Res Med Sci 2016;21:12. Amra B, Borougeni VB, Golshan M, Soltaninejad F. Pulmonary function tests and impulse oscillometry in severe chronic obstructive pulmonary disease patients' offspring. J Res Med Sci 2015;20:697-700. Ezzie ME, Crawford M, Cho JH, Orellana R, Zhang S, Gelinas R, et al. Gene expression networks in COPD: MicroRNA and mRNA regulation. Thorax 2012;67:122-31. Kara M, Kirkil G, Kalemci S. Differential expression of microRNAs in chronic obstructive pulmonary disease. Adv Clin Exp Med 2016;25:21-6. Mashreghi M, Azarpara H, Bazaz MR, Jafari A, Masoudifar A, Mirzaei H, et al. Angiogenesis biomarkers and their targeting ligands as potential targets for tumor angiogenesis. J Cell Physiol. 2018;233:2949-65. Hoseini Z, Sepahvand F, Rashidi B, Sahebkar A, Masoudifar A, Mirzaei H, et al. NLRP3 inflammasome: Its regulation and involvement in atherosclerosis. J Cell Physiol 2018;233:2116-32. Rashidi B, Malekzadeh M, Goodarzi M, Masoudifar A, Mirzaei H. Green tea and its anti-angiogenesis effects. Biomed Pharmacother 2017;89:949-56. Gholamin S, Mirzaei H, Razavi SM, Hassanian SM, Saadatpour L, Masoudifar A, et al. GD2-targeted immunotherapy and potential value of circulating microRNAs in neuroblastoma. J Cell Physiol 2018;233:866-79. Moridikia A, Mirzaei H, Sahebkar A, Salimian J. MicroRNAs: Potential candidates for diagnosis and treatment of colorectal cancer. J Cell Physiol 2018;233:901-13. Banikazemi Z, Haji HA, Mohammadi M, Taheripak G, Iranifar E, Poursadeghiyan M, et al. Diet and cancer prevention: Dietary compounds, dietary microRNAs, and dietary exosomes. J Cell Biochem 2018;119:185-96. Mirzaei H, Ferns GA, Avan A, Mobarhan MG. Cytokines and microRNA in coronary artery disease. Adv Clin Chem 2017;82:47-70. Simonian M, Mosallayi M, Mirzaei H. Circulating miR-21 as novel biomarker in gastric cancer: Diagnostic and prognostic biomarker. J Cancer Res Ther 2017. [Epub ahead of print]. Salarinia R, Sahebkar A, Peyvandi M, Mirzaei HR, Jaafari MR, Riahi MM, et al. Epi-drugs and epi-miRs: Moving beyond current cancer therapies. Curr Cancer Drug Targets 2016;16:773-88. Mirzaei HR, Sahebkar A, Mohammadi M, Yari R, Salehi H, Jafari MH, et al. Circulating microRNAs in hepatocellular carcinoma: Potential diagnostic and prognostic biomarkers. Curr Pharm Des 2016;22:5257-69. Gholamin S, Pasdar A, Khorrami MS, Mirzaei H, Mirzaei HR, Salehi R, et al. The potential for circulating microRNAs in the diagnosis of myocardial infarction: A novel approach to disease diagnosis and treatment. Curr Pharm Des 2016;22:397-403. Mirzaei H, Sahebkar A, Jaafari MR, Goodarzi M, Mirzaei HR. Diagnostic and therapeutic potential of exosomes in cancer: The beginning of a new tale? J Cell Physiol 2017;232:3251-60. Saadatpour L, Fadaee E, Fadaei S, Nassiri Mansour R, Mohammadi M, Mousavi SM, et al. Glioblastoma: Exosome and microRNA as novel diagnosis biomarkers. Cancer Gene Ther 2016;23:415-8. Kadota T, Fujita Y, Yoshioka Y, Araya J, Kuwano K, Ochiya T, et al. Extracellular vesicles in chronic obstructive pulmonary disease. Int J Mol Sci 2016;17. pii: E1801. Hough KP, Chanda D, Duncan SR, Thannickal VJ, Deshane JS. Exosomes in immunoregulation of chronic lung diseases. Allergy 2017;72:534-44. Decramer M, Janssens W, Miravitlles M. Chronic obstructive pulmonary disease. Lancet 2012;379:1341-51. Khanmohammadi R, Mir F, Baniebrahimi G, Mirzaei H. Oral tumors in children: Diagnosis and management. J Cell Biochem. 2017. doi: 10.1002/jcb.26316. [Epub ahead of print]. Masoudi MS, Mehrabian E, Mirzaei H. MiR-21: A key player in glioblastoma pathogenesis. J Cell Biochem. 2018;119:1285-1290. Golabchi K, Soleimani-Jelodar R, Aghadoost N, Momeni F, Moridikia A, Nahand JS, et al. MicroRNAs in retinoblastoma: Potential diagnostic and therapeutic biomarkers. J Cell Physiol. 2018 ;233:3016-23. Keshavarzi M, Sorayayi S, Jafar Rezaei M, Mohammadi M, Ghaderi A, Rostamzadeh A, et al. MicroRNAs-based imaging techniques in cancer diagnosis and therapy. J Cell Biochem 2017;118:4121-8. Mirzaei H, Khataminfar S, Mohammadparast S, Sales SS, Maftouh M, Mohammadi M, et al. Circulating microRNAs as potential diagnostic biomarkers and therapeutic targets in gastric cancer: Current status and future perspectives. Curr Med Chem 2016;23:4135-50. Mohammadi M, Goodarzi M, Jaafari MR, Mirzaei HR, Mirzaei H. Circulating microRNA: A new candidate for diagnostic biomarker in neuroblastoma. Cancer Gene Ther 2016;23:371-2. Fathullahzadeh S, Mirzaei H, Honardoost MA, Sahebkar A, Salehi M. Circulating microRNA-192 as a diagnostic biomarker in human chronic lymphocytic leukemia. Cancer Gene Ther 2016;23:327-32. Mirzaei H, Masoudifar A, Sahebkar A, Zare N, Sadri Nahand J, Rashidi B, et al. MicroRNA: A novel target of curcumin in cancer therapy. J Cell Physiol. 2018 ;233:3004-15. Mirzaei H. Stroke in women: Risk factors and clinical biomarkers. J Cell Biochem 2017;118:4191-202. Rabieian R, Boshtam M, Zareei M, Kouhpayeh S, Masoudifar A, Mirzaei H, et al. Plasminogen activator inhibitor type-1 as a regulator of fibrosis. J Cell Biochem 2018;119:17-27. Keshavarzi M, Darijani M, Momeni F, Moradi P, Ebrahimnejad H, Masoudifar A, et al. Molecular imaging and oral cancer diagnosis and therapy. J Cell Biochem 2017;118:3055-60. Mirzaei H, Momeni F, Saadatpour L, Sahebkar A, Goodarzi M, Masoudifar A, et al. MicroRNA: Relevance to stroke diagnosis, prognosis, and therapy. J Cell Physiol 2018;233:856-65. Rashidi B, Hoseini Z, Sahebkar A, Mirzaei H. Anti-atherosclerotic effects of Vitamins D and E in suppression of atherogenesis. J Cell Physiol 2017;232:2968-76. Barnes PJ. 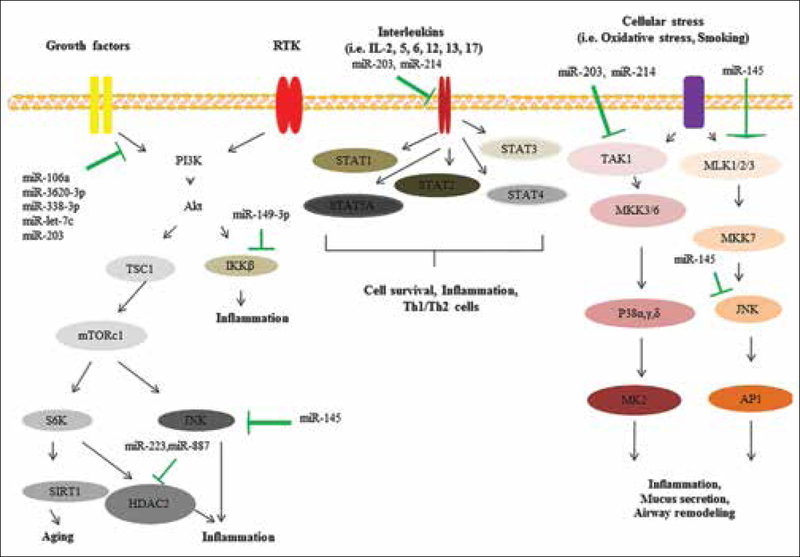 Kinases as novel therapeutic targets in asthma and chronic obstructive pulmonary disease. Pharmacol Rev 2016;68:788-815. Osei ET, Florez-Sampedro L, Timens W, Postma DS, Heijink IH, Brandsma CA, et al. Unravelling the complexity of COPD by microRNAs: It's a small world after all. Eur Respir J 2015;46:807-18. Sato T, Baskoro H, Rennard SI, Seyama K, Takahashi K. MicroRNAs as therapeutic targets in lung disease: Prospects and challenges. Chronic Obstr Pulm Dis 2015;3:382-8.
de Boer WI, van Schadewijk A, Sont JK, Sharma HS, Stolk J, Hiemstra PS, et al. Transforming growth factor beta1 and recruitment of macrophages and mast cells in airways in chronic obstructive pulmonary disease. Am J Respir Crit Care Med 1998;158:1951-7. Takizawa H, Tanaka M, Takami K, Ohtoshi T, Ito K, Satoh M, et al. Increased expression of transforming growth factor-beta1 in small airway epithelium from tobacco smokers and patients with chronic obstructive pulmonary disease (COPD). Am J Respir Crit Care Med 2001;163:1476-83. Baraldo S, Bazzan E, Turato G, Calabrese F, Beghé B, Papi A, et al. Decreased expression of TGF-beta type II receptor in bronchial glands of smokers with COPD. Thorax 2005;60:998-1002. O'Leary L, Sevinç K, Papazoglou IM, Tildy B, Detillieux K, Halayko AJ, et al. Airway smooth muscle inflammation is regulated by microRNA-145 in COPD. FEBS Lett 2016;590:1324-34. Kusko RL, Brothers JF 2nd, Tedrow J, Pandit K, Huleihel L, Perdomo C, et al. Integrated genomics reveals convergent transcriptomic networks underlying chronic obstructive pulmonary disease and idiopathic pulmonary fibrosis. Am J Respir Crit Care Med 2016;194:948-60. Laniado-Laborín R. Smoking and chronic obstructive pulmonary disease (COPD). Parallel epidemics of the 21 century. Int J Environ Res Public Health 2009;6:209-24. Du Y, Ding Y, Chen X, Mei Z, Ding H, Wu Y, et al. MicroRNA-181c inhibits cigarette smoke-induced chronic obstructive pulmonary disease by regulating CCN1 expression. Respir Res 2017;18:155. Aoshiba K, Zhou F, Tsuji T, Nagai A. DNA damage as a molecular link in the pathogenesis of COPD in smokers. Eur Respir J 2012;39:1368-76. Gorgoulis VG, Vassiliou LV, Karakaidos P, Zacharatos P, Kotsinas A, Liloglou T, et al. Activation of the DNA damage checkpoint and genomic instability in human precancerous lesions. Nature 2005;434:907-13. Caramori G, Adcock IM, Casolari P, Ito K, Jazrawi E, Tsaprouni L, et al. Unbalanced oxidant-induced DNA damage and repair in COPD: A link towards lung cancer. Thorax 2011;66:521-7. Tsuji T, Aoshiba K, Nagai A. Alveolar cell senescence exacerbates pulmonary inflammation in patients with chronic obstructive pulmonary disease. Respiration 2010;80:59-70. Paschalaki KE, Zampetaki A, Baker JR, Birrell MA, Starke RD, Belvisi MG, et al. Downregulation of microRNA-126 augments DNA damage response in cigarette smokers and COPD patients. Am J Respir Crit Care Med. 2017. doi: 10.1164/rccm.201706-1304LE. [Epub ahead of print]. Koutsokera A, Kostikas K, Nicod LP, Fitting JW. Pulmonary biomarkers in COPD exacerbations: A systematic review. Respir Res 2013;14:111. Soeda S, Ohyashiki JH, Ohtsuki K, Umezu T, Setoguchi Y, Ohyashiki K, et al. Clinical relevance of plasma miR-106b levels in patients with chronic obstructive pulmonary disease. Int J Mol Med 2013;31:533-9. Conickx G, Mestdagh P, Avila Cobos F, Verhamme FM, Maes T, Vanaudenaerde BM, et al. MicroRNA profiling reveals a role for microRNA-218-5p in the pathogenesis of chronic obstructive pulmonary disease. Am J Respir Crit Care Med 2017;195:43-56. Sato T, Liu X, Nelson A, Nakanishi M, Kanaji N, Wang X, et al. Reduced miR-146a increases prostaglandin E2in chronic obstructive pulmonary disease fibroblasts. Am J Respir Crit Care Med 2010;182:1020-9. Lewis A, Riddoch-Contreras J, Natanek SA, Donaldson A, Man WD, Moxham J, et al. Downregulation of the serum response factor/miR-1 axis in the quadriceps of patients with COPD. Thorax 2012;67:26-34. Van Pottelberge GR, Mestdagh P, Bracke KR, Thas O, van Durme YM, Joos GF, et al. MicroRNA expression in induced sputum of smokers and patients with chronic obstructive pulmonary disease. Am J Respir Crit Care Med 2011;183:898-906. Hassan F, Nuovo GJ, Crawford M, Boyaka PN, Kirkby S, Nana-Sinkam SP, et al. MiR-101 and miR-144 regulate the expression of the CFTR chloride channel in the lung. PLoS One 2012;7:e50837. Mizuno S, Bogaard HJ, Gomez-Arroyo J, Alhussaini A, Kraskauskas D, Cool CD, et al. MicroRNA-199a-5p is associated with hypoxia-inducible factor-1α expression in lungs from patients with COPD. Chest 2012;142:663-72. Baker J, Colley T, Ito K, Barnes P. The key role of microRNA-34a in the reduction of sirtuin-1 in COPD. Eur Respir Soc 2016;48: OA4977; DOI: 10.1183/13993003.congress-2016.OA4977. Pinkerton M, Chinchilli V, Banta E, Craig T, August A, Bascom R, et al. Differential expression of microRNAs in exhaled breath condensates of patients with asthma, patients with chronic obstructive pulmonary disease, and healthy adults. J Allergy Clin Immunol 2013;132:217-9. Donaldson A, Natanek SA, Lewis A, Man WD, Hopkinson NS, Polkey MI, et al. Increased skeletal muscle-specific microRNA in the blood of patients with COPD. Thorax 2013;68:1140-9. Leuenberger C, Schuoler C, Bye H, Mignan C, Rechsteiner T, Hillinger S, et al. microRNA-223 suppresses histone deacetylase 2 in chronic obstructive pulmonary disease. J Mol Med (Berl). 2016;94:725-34. Graff JW, Powers LS, Dickson AM, Kim J, Reisetter AC, Hassan IH, et al. Cigarette smoking decreases global microRNA expression in human alveolar macrophages. PLoS One 2012;7:e44066. Akbas F, Coskunpinar E, Aynaci E, Oltulu YM, Yildiz P. Analysis of serum micro-RNAs as potential biomarker in chronic obstructive pulmonary disease. Exp Lung Res 2012;38:286-94. Mi S, Zhang J, Zhang W, Huang RS. Circulating microRNAs as biomarkers for inflammatory diseases. Microrna 2013;2:63-71. Wang M, Huang Y, Liang Z, Liu D, Lu Y, Dai Y, et al. Plasma miRNAs might be promising biomarkers of chronic obstructive pulmonary disease. Clin Respir J 2016;10:104-11. Molina-Pinelo S, Pastor MD, Suarez R, Romero-Romero B, González De la Peña M, Salinas A, et al. MicroRNA clusters: Dysregulation in lung adenocarcinoma and COPD. Eur Respir J 2014;43:1740-9. Puig-Vilanova E, Aguiló R, Rodríguez-Fuster A, Martínez-Llorens J, Gea J, Barreiro E, et al. Epigenetic mechanisms in respiratory muscle dysfunction of patients with chronic obstructive pulmonary disease. PLoS One 2014;9:e111514. Xie L, Wu M, Lin H, Liu C, Yang H, Zhan J, et al. An increased ratio of serum miR-21 to miR-181a levels is associated with the early pathogenic process of chronic obstructive pulmonary disease in asymptomatic heavy smokers. Mol Biosyst 2014;10:1072-81. Oldenburger A, van Basten B, Kooistra W, Meurs H, Maarsingh H, Krenning G, et al. Interaction between epac1 and miRNA-7 in airway smooth muscle cells. Naunyn Schmiedebergs Arch Pharmacol 2014;387:795-7. Savarimuthu Francis SM, Davidson MR, Tan ME, Wright CM, Clarke BE, Duhig EE, et al. MicroRNA-34c is associated with emphysema severity and modulates SERPINE1 expression. BMC Genomics 2014;15:88. Shin JI, Brusselle GG. Mechanistic links between COPD and lung cancer: A role of microRNA let-7? Nat Rev Cancer 2014;14:70. Cao Z, Zhang N, Lou T, Jin Y, Wu Y, Ye Z, et al. MicroRNA-183 down-regulates the expression of BKCaβ1 protein that is related to the severity of chronic obstructive pulmonary disease. Hippokratia 2014;18:328-32. Conickx G, Mestdagh P, Avila Cobos F, Verhamme FM, Maes T, Vanaudenaerde BM. Am J Respir Crit Care Med. 2017 ;195:43-56. Shi L, Xin Q, Chai R, Liu L, Ma Z. Ectopic expressed miR-203 contributes to chronic obstructive pulmonary disease via targeting TAK1 and PIK3CA. Int J Clin Exp Pathol 2015;8:10662-70. Hu H, Zhang L, Teng G, Wu Y, Chen Y. A variant in 3'-untranslated region of KRAS compromises its interaction with hsa-let-7g and contributes to the development of lung cancer in patients with COPD. Int J Chron Obstruct Pulmon Dis 2015;10:1641-9. Kim WJ, Hong S, Hong Y, Lee SD, Oh Y. European Respiratory Journal 2015 46: OA1460; DOI: 10.1183/13993003.congress-2015.OA1460. Hsu AC, Dua K, Starkey MR, Haw TJ, Nair PM, Nichol K, et al. MicroRNA-125a and -b inhibit A20 and MAVS to promote inflammation and impair antiviral response in COPD. JCI Insight 2017;2:e90443. Hertig D, Leuenberger C, Rechsteiner T, Soltermann A, Ulrich S, Weder W. European Respiratory Journal 2015 46: PA583; DOI: 10.1183/13993003.congress-2015.PA583. Lu H, Xu J, Yu Z, Li J, Qiu Y, Zhang W. European Respiratory Journal 2015 46: PA4360; DOI: 10.1183/13993003.congress-2015.PA4360. Wang LQ, Wang CL, Xu LN, Hua DF. The expression research of miR-210 in the elderly patients with COPD combined with ischemic stroke. Eur Rev Med Pharmacol Sci 2016;20:4756-60. Li Z, Han N, Tian Y. MicroRNA-130a promotes apoptosis of alveolar epithelia in COPD patients by inhibiting autophagy via the down-regulation of ATG16L expression. Int J Clin Experiment Med 2016;9:23039-47. Ding Y, Tian Z, Yang H, Yao H, He P, Ouyang Y, et al. 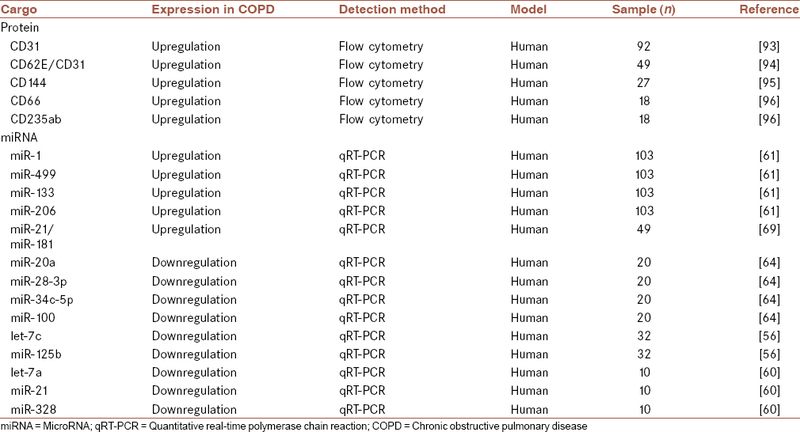 MicroRNA expression profiles of whole blood in chronic obstructive pulmonary disease. Int J Clin Experiment Pathol 2017;10:4860-5. Shen W, Liu J, Zhao G, Fan M, Song G, Zhang Y, et al. Repression of toll-like receptor-4 by microRNA-149-3p is associated with smoking-related COPD. Int J Chron Obstruct Pulmon Dis 2017;12:705-15. Liu H, Tao Y, Chen M, Yu J, Li WJ, Tao L, et al. Upregulation of microRNA-214 contributes to the development of vascular remodeling in hypoxia-induced pulmonary hypertension via targeting CCNL2. Sci Rep 2016;6:24661. Wang R, Xu J, Liu H, Zhao Z. Peripheral leukocyte microRNAs as novel biomarkers for COPD. Int J Chron Obstruct Pulmon Dis 2017;12:1101-12. Xie L, Yang F, Sun S. Expression of miR-21 in peripheral blood serum and mononuclear cells in patients with chronic obstructive pulmonary disease and its clinical significance. Zhong Nan Da Xue Xue Bao Yi Xue Ban 2016;41:238-43. Leidinger P, Keller A, Borries A, Huwer H, Rohling M, Huebers J, et al. Specific peripheral miRNA profiles for distinguishing lung cancer from COPD. Lung Cancer 2011;74:41-7. Sanfiorenzo C, Ilie MI, Belaid A, Barlési F, Mouroux J, Marquette CH, et al. Two panels of plasma microRNAs as non-invasive biomarkers for prediction of recurrence in resectable NSCLC. PLoS One 2013;8:e54596. Ellis KL, Cameron VA, Troughton RW, Frampton CM, Ellmers LJ, Richards AM, et al. Circulating microRNAs as candidate markers to distinguish heart failure in breathless patients. Eur J Heart Fail 2013;15:1138-47. Saeedi Borujeni MJ, Esfandiary E, Taheripak G, Codoñer-Franch P, Alonso-Iglesias E, Mirzaei H, et al. Molecular aspects of diabetes mellitus: Resistin, microRNA, and exosome. J Cell Biochem. 2018;119:1257-72. Gordon C, Gudi K, Krause A, Sackrowitz R, Harvey BG, Strulovici-Barel Y, et al. Circulating endothelial microparticles as a measure of early lung destruction in cigarette smokers. Am J Respir Crit Care Med 2011;184:224-32. Strulovici-Barel Y, Staudt MR, Krause A, Gordon C, Tilley AE, Harvey BG, et al. Persistence of circulating endothelial microparticles in COPD despite smoking cessation. Thorax 2016;71:1137-44. Takahashi T, Kobayashi S, Fujino N, Suzuki T, Ota C, He M, et al. Increased circulating endothelial microparticles in COPD patients: A potential biomarker for COPD exacerbation susceptibility. Thorax 2012;67:1067-74. Lacedonia D, Carpagnano GE, Trotta T, Palladino GP, Panaro MA, Zoppo LD, et al. Microparticles in sputum of COPD patients: A potential biomarker of the disease? Int J Chron Obstruct Pulmon Dis 2016;11:527-33. Fujita Y, Araya J, Ito S, Kobayashi K, Kosaka N, Yoshioka Y, et al. Suppression of autophagy by extracellular vesicles promotes myofibroblast differentiation in COPD pathogenesis. J Extracell Vesicles 2015;4:28388. Burke H, Spalluto CM, Cellura D, Staples KJ, Wilkinson TMA. European Respiratory Journal 2015 46: OA2930; DOI: 10.1183/13993003.congress-2015.OA2930. Tan DB, Armitage J, Teo TH, Ong NE, Shin H, Moodley YP, et al. Elevated levels of circulating exosome in COPD patients are associated with systemic inflammation. Respir Med 2017;132:261-4. Pearson M. Is the primary mechanism underlying COPD: Inflammation or ischaemia? COPD 2013;10:536-41. Barnes PJ, Shapiro SD, Pauwels RA. Chronic obstructive pulmonary disease: Molecular and cellular mechanisms. Eur Respir J 2003;22:672-88. Alipoor SD, Mortaz E, Garssen J, Movassaghi M, Mirsaeidi M, Adcock IM, et al. Exosomes and exosomal miRNA in respiratory diseases. Mediators Inflamm 2016;2016:5628404. Tüfekci KU, Oner MG, Meuwissen RL, Genç S. The role of microRNAs in human diseases. Methods Mol Biol 2014;1107:33-50. Li CJ, Liu Y, Chen Y, Yu D, Williams KJ, Liu ML, et al. Novel proteolytic microvesicles released from human macrophages after exposure to tobacco smoke. Am J Pathol 2013;182:1552-62. Moon HG, Kim SH, Gao J, Quan T, Qin Z, Osorio JC, et al. CCN1 secretion and cleavage regulate the lung epithelial cell functions after cigarette smoke. Am J Physiol Lung Cell Mol Physiol 2014;307:L326-37. Chew LP, Huttenlocher D, Kedem K, Kleinberg J. Fast detection of common geometric substructure in proteins. J Comput Biol 1999;6:313-25. Fujita Y, Kosaka N, Araya J, Kuwano K, Ochiya T. Extracellular vesicles in lung microenvironment and pathogenesis. Trends Mol Med 2015;21:533-42. Fujita N, Jaye DL, Kajita M, Geigerman C, Moreno CS, Wade PA, et al. MTA3, a mi-2/NuRD complex subunit, regulates an invasive growth pathway in breast cancer. Cell 2003;113:207-19. Letsiou E, Sammani S, Zhang W, Zhou T, Quijada H, Moreno-Vinasco L, et al. Pathologic mechanical stress and endotoxin exposure increases lung endothelial microparticle shedding. Am J Respir Cell Mol Biol 2015;52:193-204. Takahashi T, Kubo H. The role of microparticles in chronic obstructive pulmonary disease. Int J Chron Obstruct Pulmon Dis 2014;9:303-14. 1 Influenza vaccine: Where are we and where do we go?